Dr. Cunningham is chief of the Division of Craniofacial Medicine and professor of pediatrics in the Department of Pediatrics at the University of Washington School of Medicine. 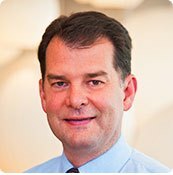 He is medical director of Seattle Children’s Craniofacial Center and holds the Jean Renny Endowed Chair in Craniofacial Medicine. He is also adjunct professor in the Departments of Biological Structures, Oral Biology and Pediatric Dentistry at the University of Washington. Dr. Cunningham balances responsibilities in administration, patient care and research. He does bedside teaching of medical students, pediatrics residents and dental students. His clinical interests focus on the diagnosis and long-term interdisciplinary care of children with craniofacial malformations, with a particular interest in craniosynostosis. He is co-investigator on several clinical research projects, ranging from the epidemiology of positional plagiocephaly to computer modeling of craniofacial conditions. Funded through the National Institute of Dental and Craniofacial Research, Dr. Cunningham’s basic molecular and developmental biology lab has been open since 1993 and is using human and mouse models to investigate the molecular causes of craniosynostosis and developmental pathogenesis of midface hypoplasia associated with syndromic craniosynostosis.